I used to churn artwork out at such a quicker pace. Working sporadically now, in between the hiccups of daily life, it takes extra determination to actually see a piece through to completion. This season in life is teaching me more about keeping at it faithfully, staying rooted and not losing heart even if my intervals between art making can often be longer than desired. My goal is to continue creating for the long haul. If it takes me months to complete a piece, so be it, at least I can say that I’m still actively creating. How very meaningful, without premeditation, was the subject matter of this piece just finished. I began painting this tree just for the exercise of it nearly 8 months ago, but found as it developed it had certain similarities to an anatomical heart. 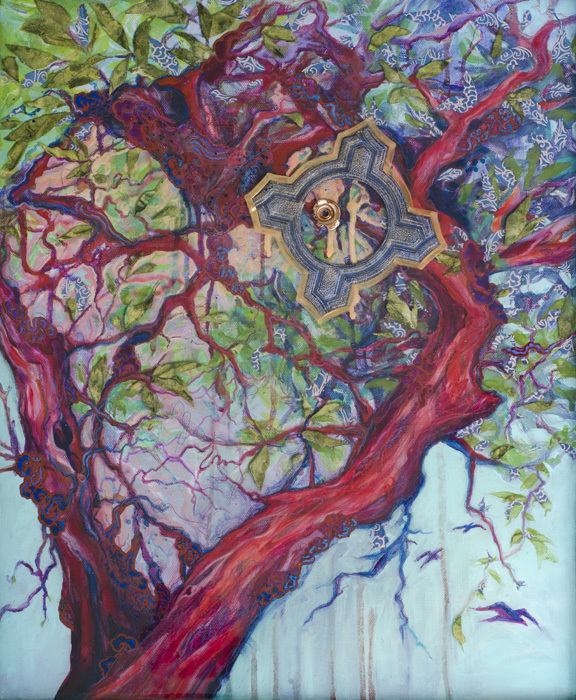 To embrace the dual aesthetic, I simultaneously developed parts of a tree with its intermingled branches and parts of a heart with all of its intersecting veins. I meditated on how both are life giving, compasses in a sense, able to provide direction. And how the heart is the wellspring of life and growth. The labor intense layers of mixed media and resin (paint, handmade paper, thread, etc) that add depth to the piece are not as visible in this photo as I would have liked. Reality noted that some things just can not be reproduced. Hang in there. You are on a winning path. Moms think LONG. My oldest, artist Ruth Meharg, married this summer at 24. My youngest, Jubilee, is 8. There are four boys in between. Just keep hammering away. On days when you can’t get to making art, find a way to read about art, or just look at beautiful work in a magazine. This is definitely a race where slow and steady wins.